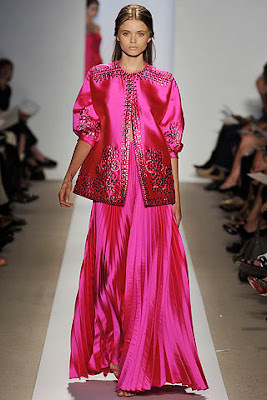 Beautiful shades of hot pink were seen in many designer's collections for Spring 2009. These are a few of the more modestly inclined outfits. I love this shade of pink :) I own a few tops this colour and it always makes me feel confident. Like you I'm not sure I'd wear it head to toe though! So cute color! I used to make some dresses. Have a look at my simple blog,shows my everyday new design that i sew by my self. I used to work for La Perla about ten years ago, and have always loved their fabrics and cuts. So nice to see styles that are hijab friendly. I especially love the second pic. Its so abstract, but I'm usually a sucker for anything pink and pretty. Hot pink looks great on tanned skin. Asian girls shouldn't be afraid to experiment with bright colours. I think it rly suits us! What pretty shades of pink. I love to wear a pink blazer over a brown abaya/dress. 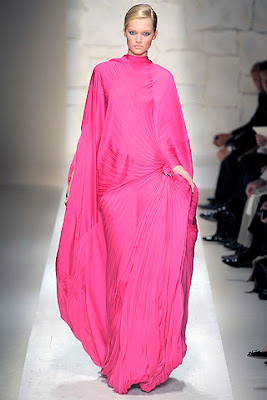 Jana, do you have any suggestions for hijaab fabric during the summer that will keep cool and still looks good? Also, Sabrina @ sliceoflemon.com posted some beautiful photos of how she made her Indian wedding gowns hijab-friendly. Oh that colour is adorable!